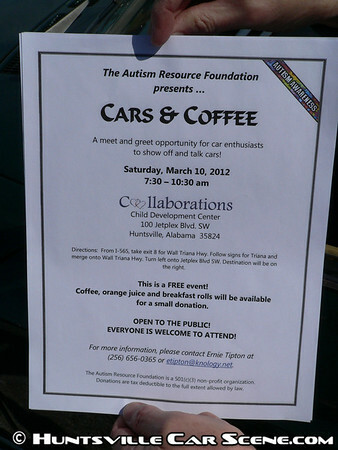 The Autism Resource Foundation is hosting a cars & coffee style meet and greet on March 10, 2012, from 7:30am until 10:30am (time to come out, have some coffee and chat, and still make it to any other car events that day). There are no registrations or entry fees, just a gathering of car fans to show off what you have and talk cars. All cars and spectators are welcome. The Autism Resource Foundation will be providing coffee, etc, for a small donation. The long range forecast predicts "brilliant sunshine" (accuweather.com). So bring your car, maybe a folding chair, but don't stop at McDonalds for your coffee. Please come out and support the Autism Resource Foundation. My cell number is 256-656-0365 in case anyone needs some help finding the place. Many thanks to Samir for his coverage of our previous events, and to all the car people who came out to talk cars and support the Autism Resource Foundation. A great morning with the promise of a beautiful day made waking up extra early easy. And a lot of people showed up with everything from classic Corvettes, Porsches, Triuphs, and Fiats, to a new GT500 Mustang, an Audi R8 Spyder, and even a brand new Porsche Turbo S. There was something for everyone--from Euro tuning, to kit cars, classic restorations, American muscle, and exotic--you found it here. Everyone had a good time and really enjoyed our little secluded spot with plenty of parking. The view to the road is also nice where you can hear the pleasant hum of a car leaving the event. Ernie mentioned making this event a staple at the second Saturday of every month. Once this is finalized, Huntsville will have its own official Cars and Coffee. No more driving to Nashville or Atlanta to enjoy an early morning event. Everyone has agreed that it is a good location, including exotic owners, so we should see some really great cars here every month. And of course, it's for a great cause supporting a local charity that's directly helping our community. That Google maps link sends me to Kansas, by the way. I will probably be there. Same here. The event is located off Wal Triania just James Rector Rd. on the left if you're coming from 565.
and I would be out of town for this...........I was looking forward to it since it's the first show/meet/whatever of the year. Thank you for the post Ernie! Great to run into you at CBI this weekend and grab a shot of the flyer. I've been trying to get in touch with you to meet with you about moving this event to Providence Cafe in Providence. I think the event could be much larger at this venue, and Providence Cafe is willing to donate a portion of the proceeds to ARF. Get in touch with me when you can, 615-512-5520. Last edited by Samir; March 5th at 09:55 AM. Providence would be an awesome location! Looks like the weather is going to cooperate after all, aside from being a little chilly. I still hate I'm going to miss this. Yeah Providence is much closer for me and I'd think it would be a better location for most others as well. And the idea goes down the tubes--Providence Cafe no longer exists. It would have been the perfect venue and we probably could have helped them survive. The Lesson? Businesses can miss opportunities when they forget about enthusiasts and Huntsville Car Scene.com.